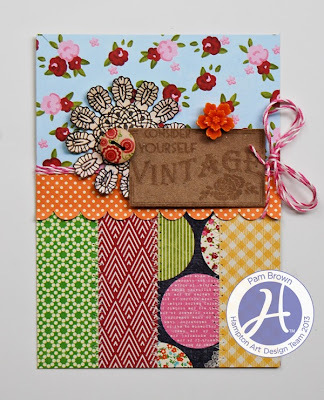 Cards and Tags galore by Dana Warren and Pam Brown! I love mixing and matching different product lines to create a unique project. For this card, I mixed stamps from the licensed Echo Park Oh Snap stamps and the licensed Jillibean Soup Irish Farm House Soup stamps. I stamped the sentiment on kraft paper with watermark ink and stamped the doily with brown ink onto patterned paper. I then cut the doily out and layered the sentiment over it. 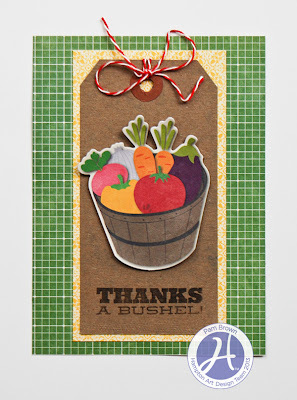 I created this sweet and simple card using one of the licensed Jillibean Soup Fresh Vegetable Soup stamps. 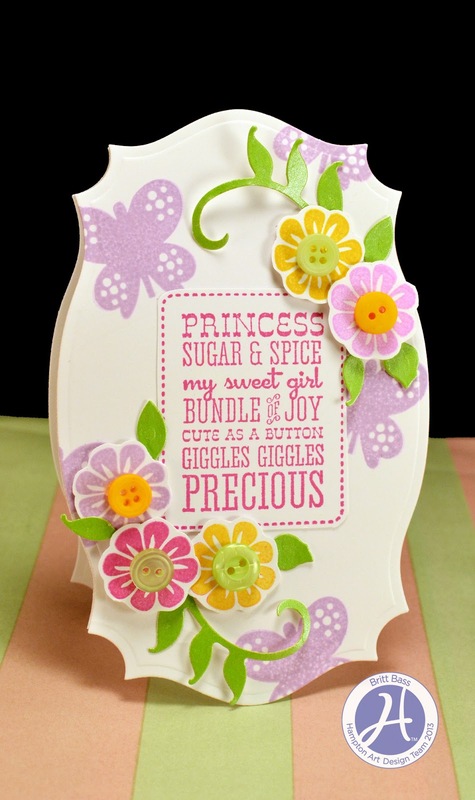 There are so many cute and clever sentiments in this set that I wanted to make this one shine. I stamped the sentiment on the bottom of a shipping tag and found a die cut that coordinated with the sentiment. Hi! Today I have a card for big kid, you know not a kid who is a teen or even tween but who isn’t a little kid anymore! This is perfect if that kid happens to like fish!! Cut Birthday Fish and balloon from cardstock. Use ink to lightly ink edges. Assemble. Adhere graph pattern paper to cardbase. 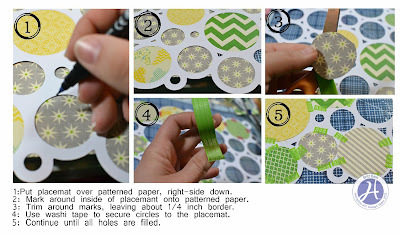 With circle punch, punch half circles from blue cardstock and pattern paper to make waves. Hi Hampton Art Fans!! Today I have a tag set and envelope that you can give as a gift. When I started this project I was going to make a card so I started with a strip of cardstock. But after stamping I thought the image would make some nice tags! 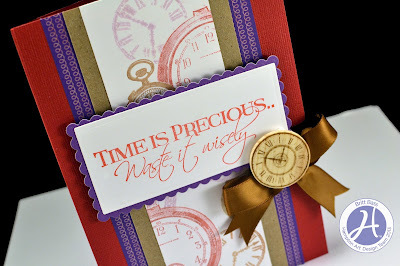 Stamp word background from Tick Tock stamp set with Putty ink. Stamp Tree Top in Khaki Green ink. Round corners, punch hole at top and add twine. On cardstock strip stamp Tree Top with Khaki Green ink. Mask sides of cardstock so to only stamp in the square the Tree Top stamp makes. Hi! Gretchen here with a card to share today. This card turned out to be very simple but I love the way it looks. I kept trying to add more to it but then it would just look forced and too busy. So simple it is! 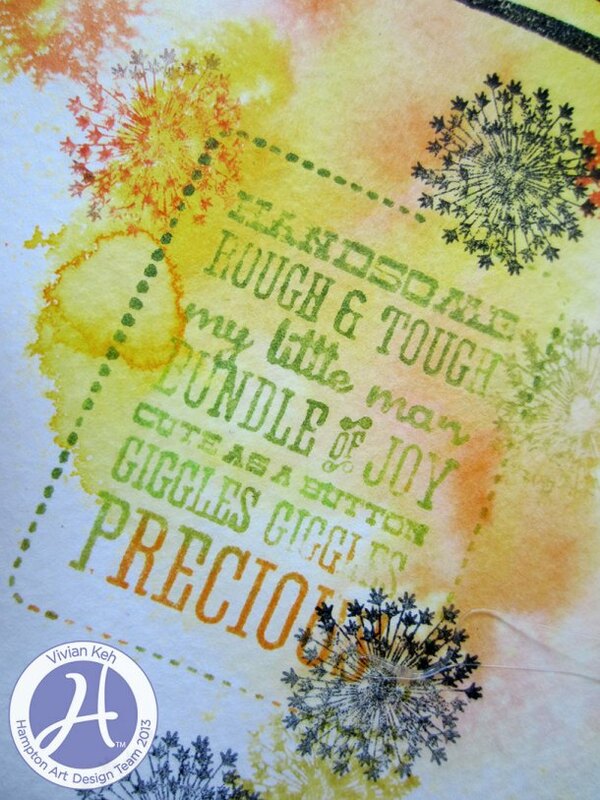 I cut the "beautiful" sentiment out of a sheet of the new KI Memories Mini Celebrations patterned papers. I rounded the corners to soften the look a bit and then matted the sentiment on a piece of pretty pink patterned paper. 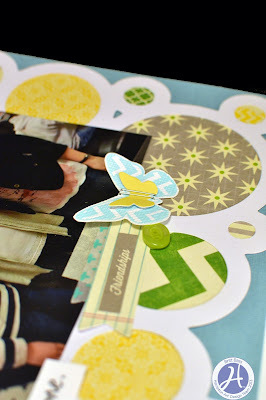 On the bottom of the card I added one of the new ruffled stickers as a fun border. The ruffled stickers are great because they give your project instant texture and dimension with very little work on your part! I love that! Have a great day and thanks for checking out my simple card! Hi there! It's Gretchen & I've got a simple card to share with you today. This card was made out of one sheet of patterned paper! The new KI Mini Celebrations paper are perfect to cut up to use for cards (and Project Life!). And since it is all one sheet of paper, it all matches! Easy! I sanded the edges of the background papers and the "love" block to give the edges a softer look. 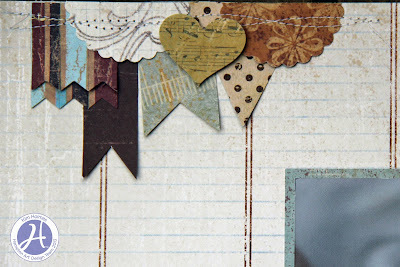 I cut a couple hearts out of the patterned paper to use as embellishments. Also I used some foam adhesive to give this card nice dimension. Thanks for looking! 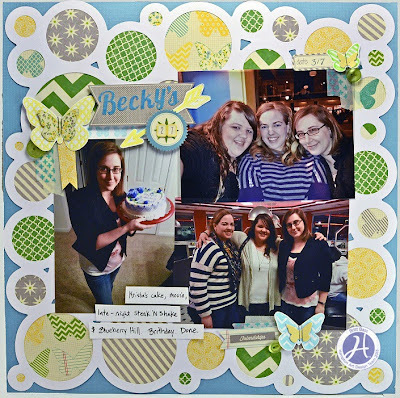 Three Amazing cards by Britt Bass and Kim Frantz! Hello! Britt Bass here, bringing you a pretty little Baby shower card using two Echo Park licensed stamps sets and Clearsnap chalk ink. I love scrapbooking supplies of (pretty much) every shape, size, and style but there is nothing quite like the versatility of a stamp and ink. 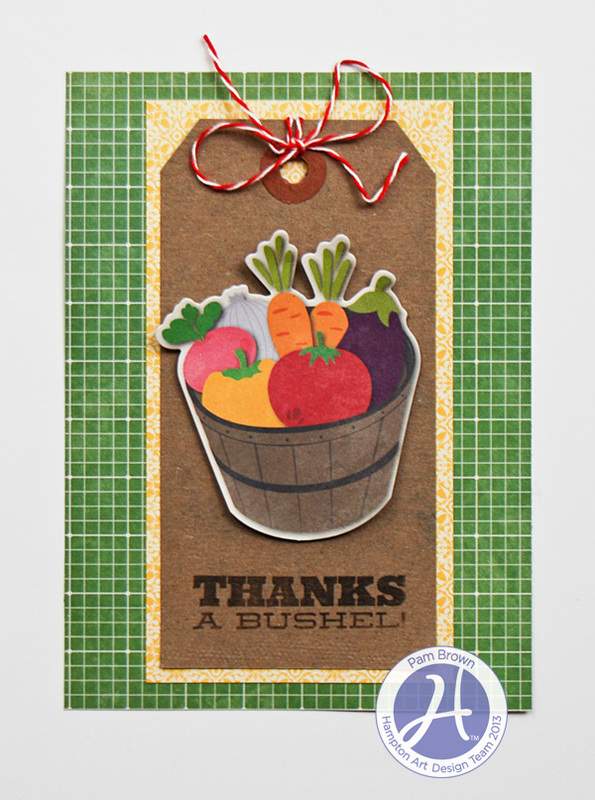 For this card I used only a bit of green cardstock (for the leaves) and let the stamps do all the talking. 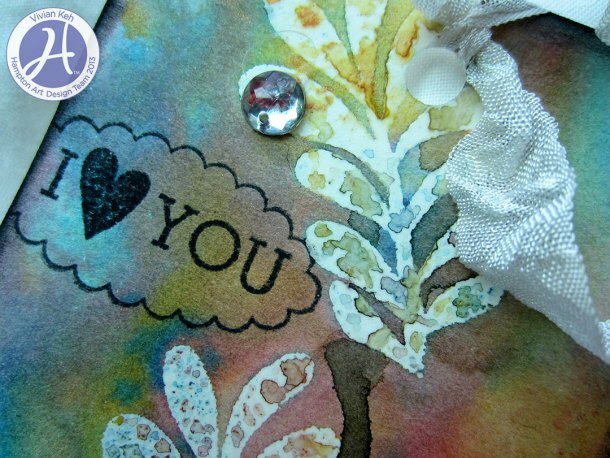 I loved the pretty shape that the die template gave to my card and it really gave me an excellent canvas for my stamping. 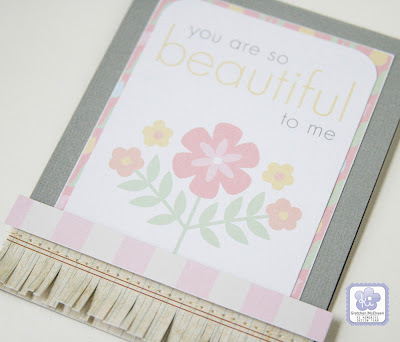 Creating embellishments, like the flowers on my card, is one of my favorite ways to use stamps. If I want these flowers to coordinate with a blue and green collection all I have to do is change my ink. 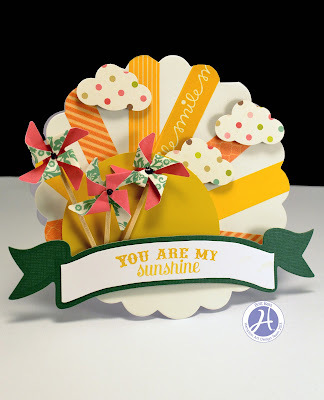 Britt Bass here with a card inspired by the summer sunshine, and a beautiful sentiment from one of the Authentique licensed stamp sets, stamped in Clearsnap pigment ink. I really wanted to create a scene that seemed to burst of the front of the card. There isn't much stamping on this card, its true, but I find that I often start with a sentiment that gives me a clear, strong feeling. 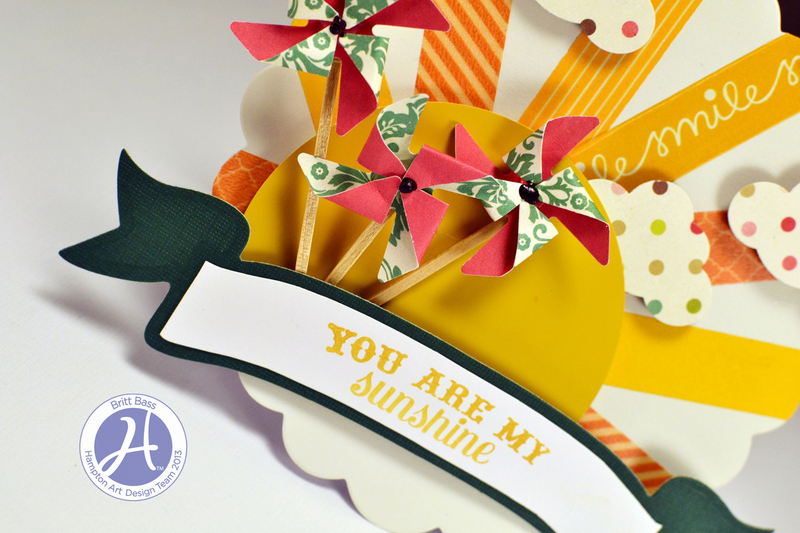 Though this is an oft-used sentiment, I think that the movement of the sun's rays and the cheerful pinwheels give a thousand extra words; You are my sunshine, my playfulness, and my puffy polk-a-dot clouds. You are all the good things a day can hold. 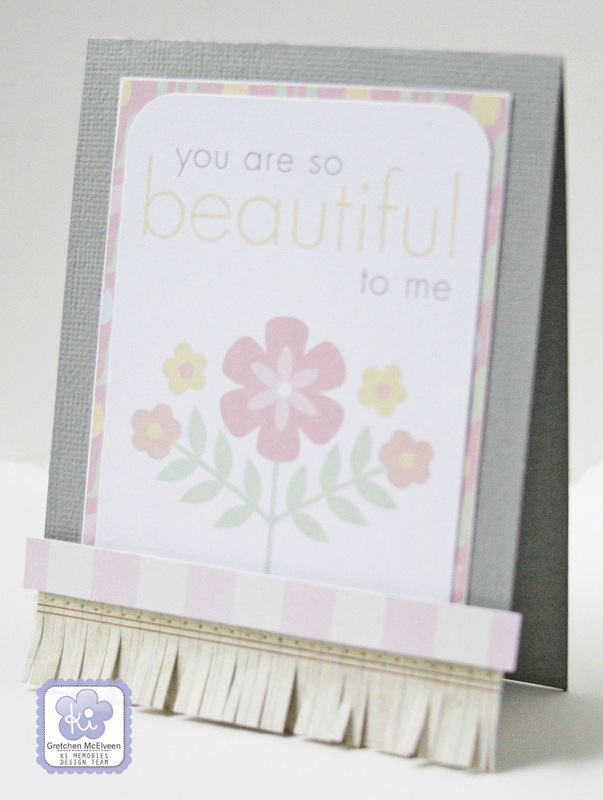 This fun clipboard-style card can be used for any occasion. The "clip" is cut from cardstock and simple adhered to the top of the card. 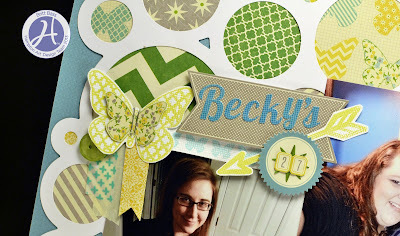 Tuck elements under the clip for a random or collage look. 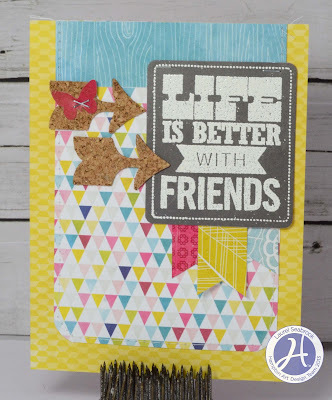 Bella Blvd: Sand & Surf Patterned Paper, Stamps/Kiss Me/Sand & Surf. Other: Black Ink/Ranger, Color Ink/Colorbox, Cardstock. 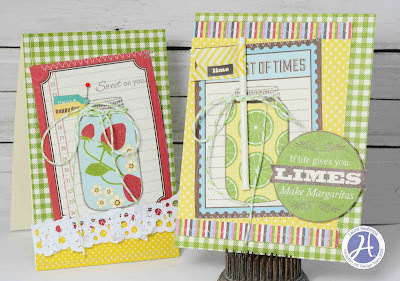 Two fun cards created by Gini Williams Cagle! 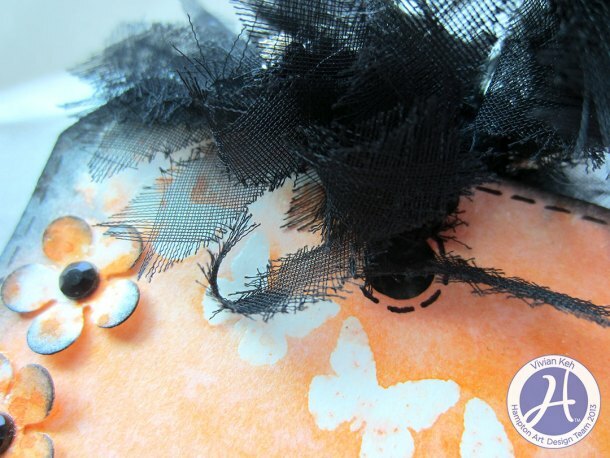 Glue strips of lace across the front of a 5 x 5 card base. Die cut the decorative square and glue to the center of the card. Punch a small circle the size for your moon and adhere to white paper with repositionable adhesive. 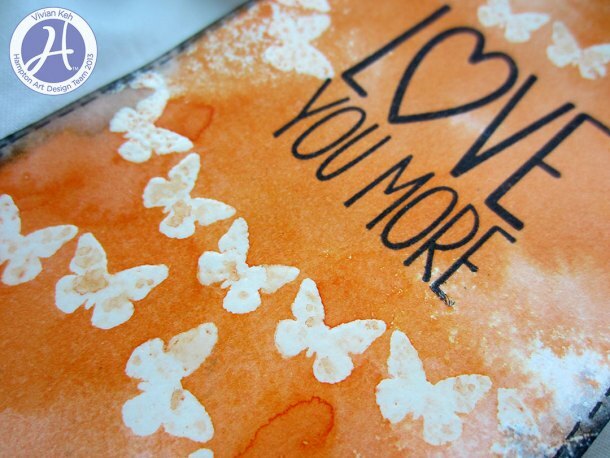 Stamp the design over the moon using watermark ink and heat emboss with clear powder. Blend shades of blue and purple over the image and wipe off excess ink with a paper towl. Stamp the sentiment and remove the paper moon mask. Adhere to the card with foam adhesive and finish with a bow. 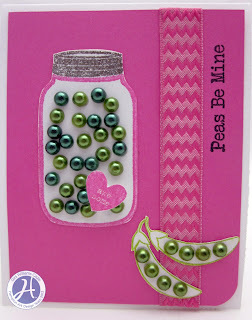 Hi, it’s Gini – Normally I don’t make clean and simple cards, but when I saw this adorable Fresh Vegetable stamp set, I thought it would be really cute to add pearls for my peas. I was afraid if I added too much more, it would take away from the cute factor. Stamp the canning jar lid with the watermark ink and heat emboss with silver powder. Line up the jar base and stamp with bubblegum ink. Fussy cut the image. Stamp one Candy Heart , cut and glue to the jar with foam adhesive. Randomly arrange green pearls in the jar for peas. Stamp two pea pods, and cut them out. Add pearls where the peas are stamped. 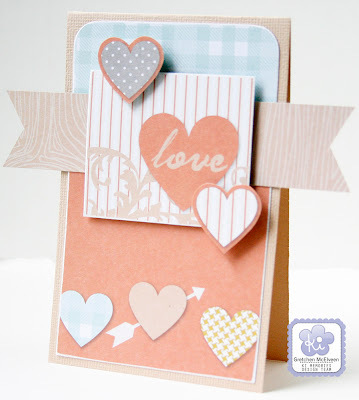 Round the bottom corners of the pink cardstock, and adhere chevron ribbon to the right side. Stamp the sentiment along the ribbon. 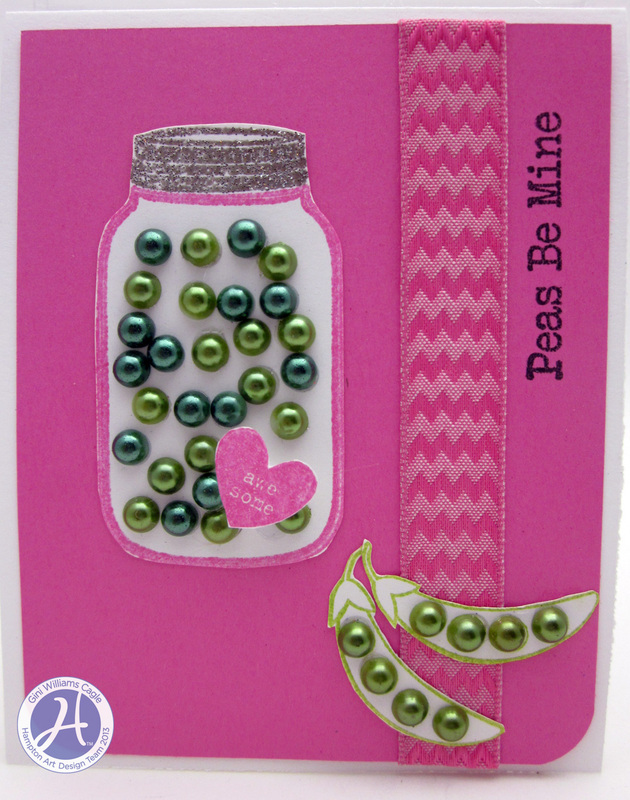 Glue the pea pods and jar of peas as shown to finish the card.
" I love these new stamp and die sets and couldn't wait to use the arrow with the cork I have had laying around collecting dust." Weddings, Babies and Dragonflies? That's what's up on the blog today! Hi Hampton Art fans!!! Today I have a wedding card to share with you, I know wedding season is in June, but people get married all the time!!! LOL This card is perfect for a fast wedding card, it didn’t take long and it has a nice neutral color scheme so it can work for any wedding. 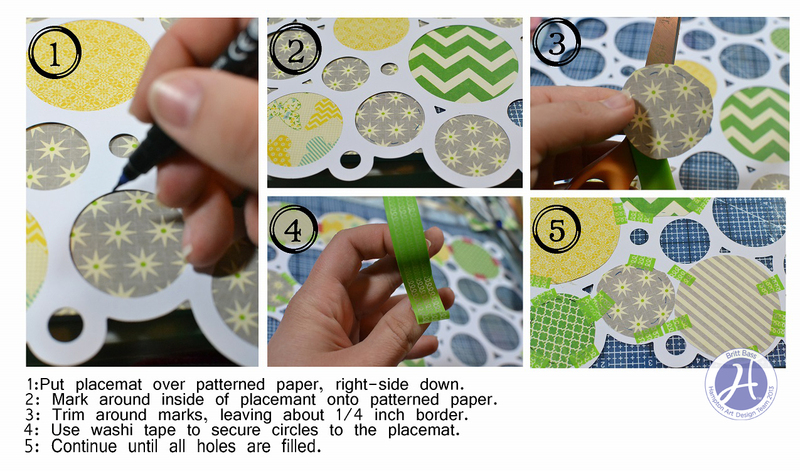 Trim doily pattern paper to cardbase size. Trim and adhere bejeweled doily transparency to cardbase. Stamp and emboss wedding dress. Color dress with watercolors. Hi there!! Today I have vintage card to share! My kind of vintage is what I call light vintage, a vintage style stamp, distressed inked edges, maybe some vintage pattern paper. This time I made it vintage-y by using ink! Have you ever stamped with dye ink then again over it with pigment? 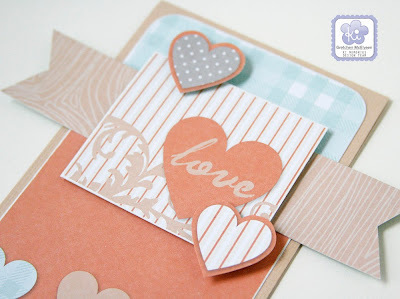 Depending on your colors, you can get nice vintage look to any stamp! Give it a try!! Stamp dragon fly with Frosted Plum Dye Ink. Stamp again with Mix;d Media Inx Pewter Pigment Ink. Stamp File Tab multiple times over cardbase. After stamping each tab, lightly rub ink around, I use a dried baby wipe. If ink is very wet, let dry a few seconds, you don’t want the image smeared only blurred a little. Stamp postage stamp over cardbase with Jasmine pigment ink. This one I taped the image with my dried baby wipe then rubbed. I wanted the image to be a little more blurred then the tabs. Attach brad to book page and adhere to card base. Hello, Kim with you today to share a layout I created with the Vintage Charm Collection from KI Memories. This collection was super easy to work with…my quick & easy layout came together in just a few minutes. Hi there! Britt Bass here to share a stamped-upon layout using the Jillibean Soup line “Chilled Cucumber Soup” and Clearsnap pigment ink. Easy-peasy, right? I know you will love them! I am so proud of this layout – it came out exactly how I wanted it to! Don't you just love that? Good day stamp fans! Britt Bass here to share a card you need to take some TIME and look at! 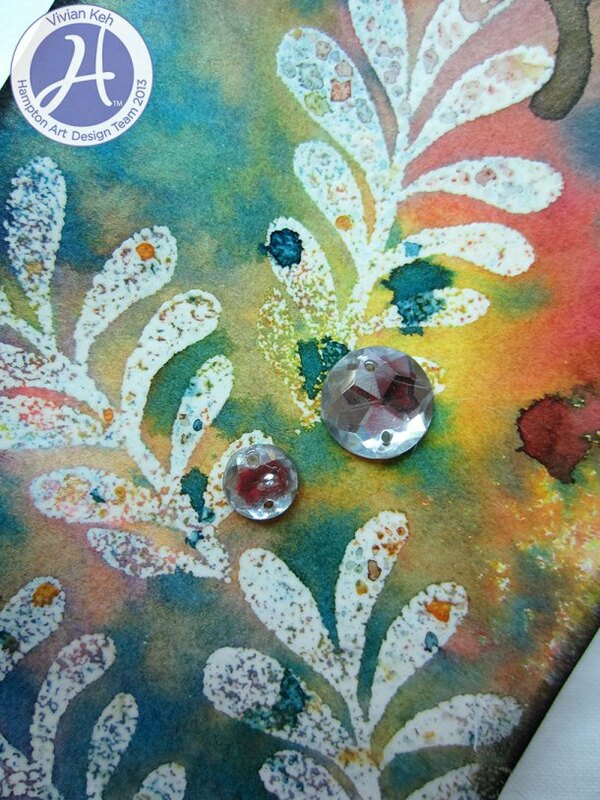 This card features two 7gypsies co-branded stamp sets and Clearsnap pigment and chalk ink. I often choose my sentiment first and then let the rest of the card come together around that one idea. It helps me focus on a one or two specific ideas which give my designs some unity. I try to pick out, or create elements that contribute to my chosen sentiment. Think of it this way, if a person who didn't speak English looked at your card, could they still understand the “sentiment” behind it? If you think they could – you are on the right track! I created the center, stamped panel using a simple masking technique. 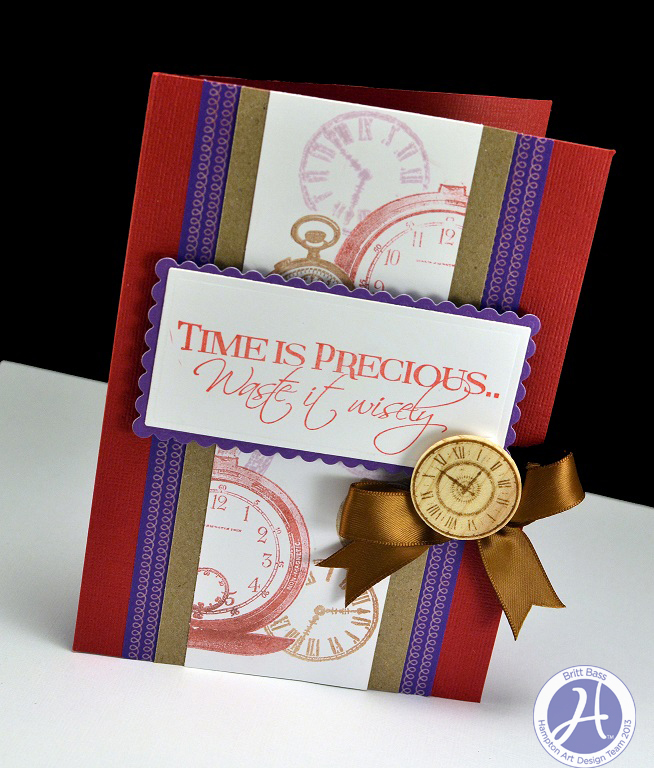 I stamped each clock on a sticky note and used those masks to collage those clock stamps together. 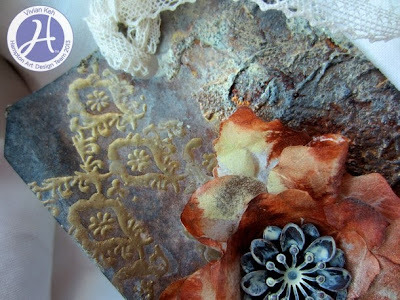 I love the look of pigment ink and chalk ink together; mixing the ink creates extra texture without adding bulk. 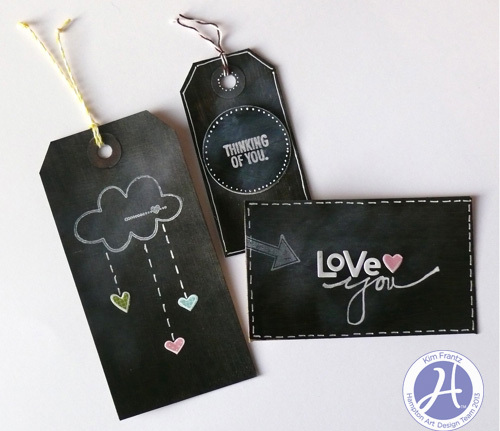 Create the look of a chalkboard with paint and white ink! Simply paint the surface of anything you wish using chalkboard paint...here I used kraft tags and a kraft envelope by Jillibean Soup. You could use black paint, but I think the chalkboard paint gives the surface a bit more texture. Use white ink, white gel pens, and your favorite stamps. Welcome any uneven lines you may get with the stamps. It lends to the "chalk" look! 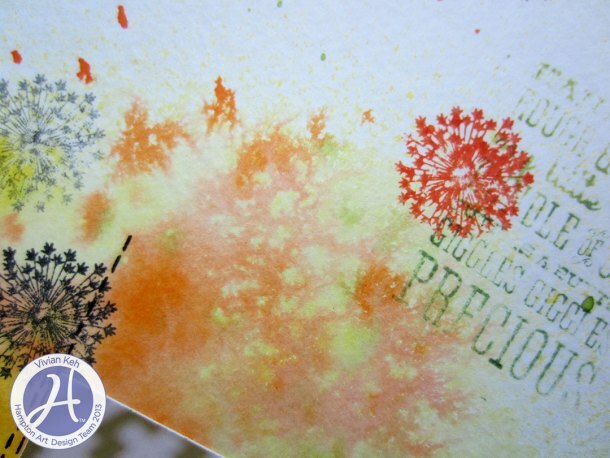 Use a sponge dauber to lightly apply white ink over the surface in random places. This creates the look of a chalkboard that has been erased. I added some heart stickers for a small pop of color. Jillibean Soup: Alphabeans/Whipped White, Cardstock Stickers/Coconut Lime Soup, Kraft Paper Tags and Mini Envelope. Bella Blvd: Stamps/Kiss Me/Sand & Surf. Other: Chalkboard Paint/Martha Stewart Crafts, White Ink/Ranger, White Gel Pen/Gelly Roll by Sakura. Amazing tags and layout by Vivian Keh! Hi there, Hampton Art fans! 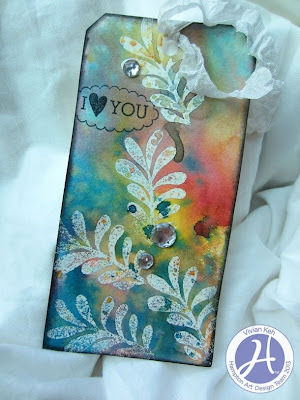 Vivian Keh here to share with you a tag I crafted with my Hampton Art stamps. 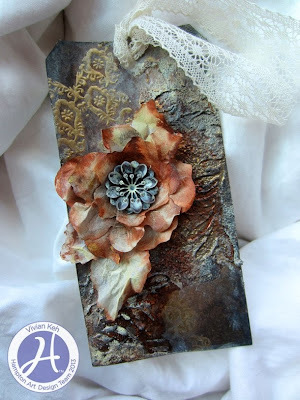 Today's grungy effect was achieved using stamps in conjunction with texture paste. A bit of lace gave the project some light and softness. 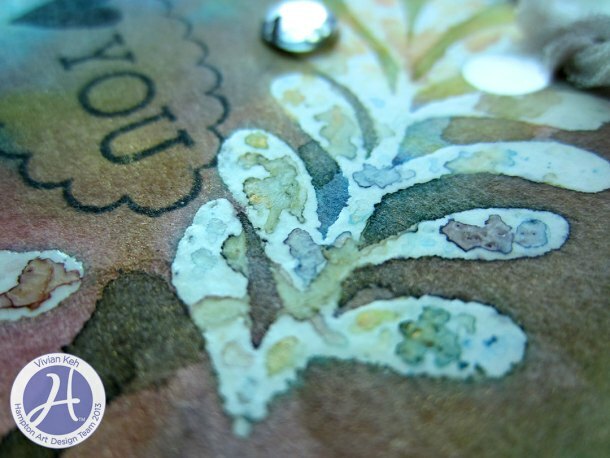 If you haven't stamped into paste before, I hope you will give it a try. Very fun. Of course, the impression is not precise as it is with regular stamping. 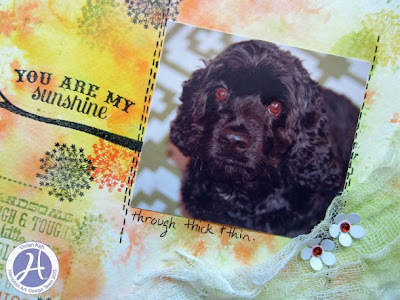 But with the right stamp (filled shapes, the simpler the better, not fine lined stamps), you can achieve interesting textures and an almost immediate grunge appeal. For my focal image I crafted a blossom using a technique I shared in a recent video. 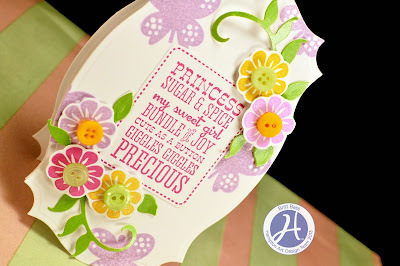 I also did some heat embossing with a beautifully decorative butterfly stamp that comes in the Hampton Art/ Echo Park SC0524 "Sweet Girl" stamp set that I used for this project. 1. Heat emboss gold butterflies on tag. 2. Spread texture paste on portions of tag. 3. Stamp into wet texture paste to create impressions. Press hard. 4. 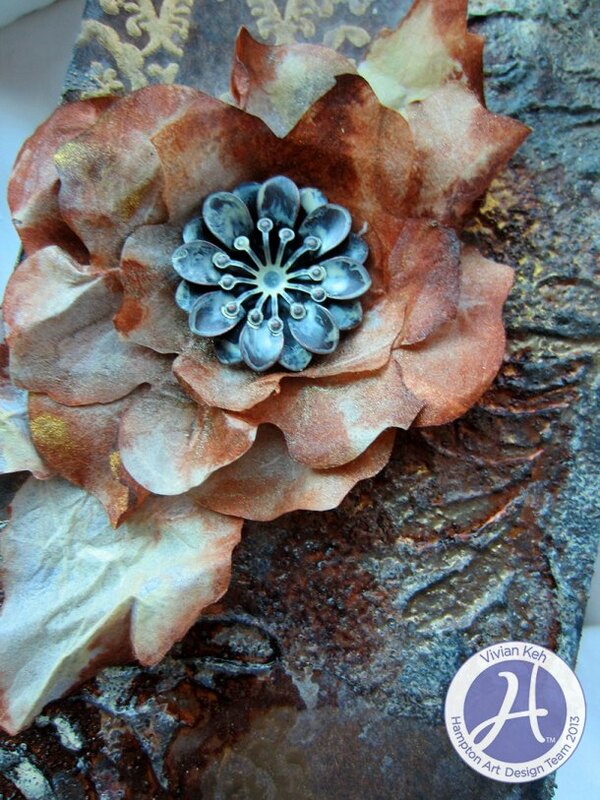 Sprinkle embossing powder onto wet texture paste. 5. Use heat tool to dry. 6. Spray mists and dry. 7. Use distress ink on edges. 7. Apply chalk ink over raised areas and dry. Hello, friends! Vivian Keh here with a tag that celebrates my love of color. I have been using primary colors in my crafting projects a lot lately and appreciating so much how the colors mix on my papers, enjoying the process as much as, if not more than, the result lol! Using my Hampton Art/ Echo Park SC0524 "Sweet Girl" Clear Stamp Set, I heat embossed clear, then went over with a nice selection of mists. Personally, I prefer it when the embossing is imperfect, when little nooks and crannies are left after heating, because this leaves interesting little dots of paper surface within the stamped image that take pigment nicely. It's also attractive, as you can see below, when mists pool and dry on top of the embossing. The sentiment came from the same stamp set. 1. 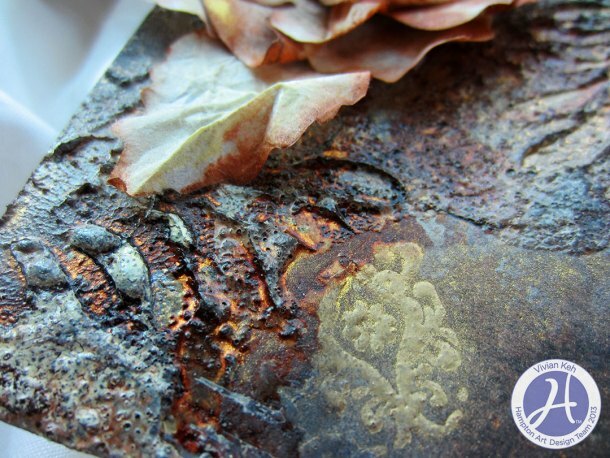 Heat emboss the leaf shapes using clear embossing powder. 2. Mist on top using primary colored mists and water. Then dry. 3. Stamp sentiment and add embellishments. 4. Use distress ink along edges. 5. String seam binding through the top. Hello, friends! 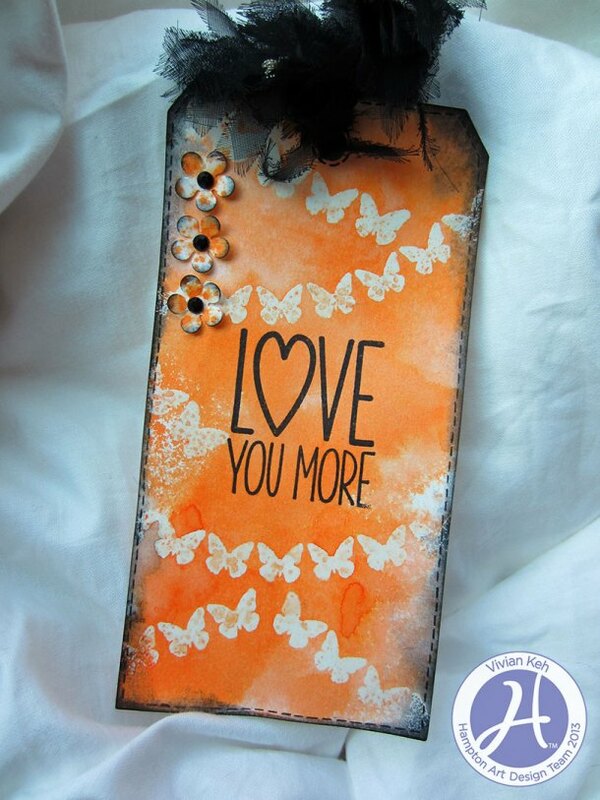 This month at Hampton Art, I went a little tag crazy! I love the tag format - something about it always encourages me to experiment and play. Today's tag is very simple and a little funky. I used Hampton Art/ Jillibean Soup's jb0040 "Chilled Cucumber Soup" Clear Stamp Set, bending the butterfly straight strip into more of a bough shape before stamping and heat embossing with it. I used only one pretty tangerine colored mist to bring out my masked butterfly boughs. And used the largest sentiment from the set in the center. I have some funky black tulle trim that I picked up eons ago and have been hoarding. I used it here to accentuate a playful, funky feeling. 1. Curve the straight butterfly strip on your acrylic block. 2. Stamp and heat emboss clear. 3. Spray with mist and water. 4. Distress edges and draw stitch marks around the perimeter. 5. Add small floral embellishments, and tie tulle at the top. Well, not so little - a handsome and healthy 30 something pounds. He's been with me through thick and thin, and these days enjoys tons of sleep, homemade dog food, play sessions at sunset (which keep him svelte lol) - quite the life. 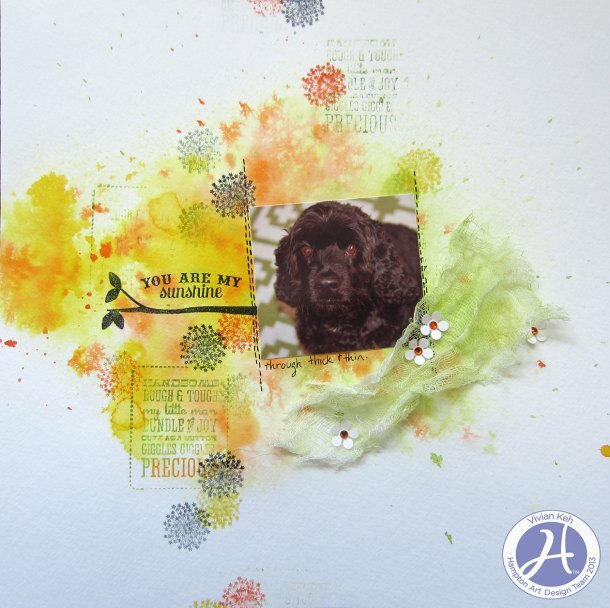 The sentiment and dandelion stamps are from the Hampton Art/ Authentique IC0233 "Footloose" Cling Stamp Set. These words and the bold branch stamp are from the Hampton Art/Echo Park SC0527 "Bundle of Joy" Clear Stamp Set. The background was achieved by playing with mists and water. I tried to leave alone those areas where the misting patterns turned out particularly interesting to me. Hope you enjoyed my project today! 1. Spray watercolor paper with mists and water. 2. Stamp images and sentiment. Some of these were stamped with plain black ink. Others were stamped with Stamper's Big Brush Pens in coordinating colors. 5. Adhere cheesecloth and embellishments. 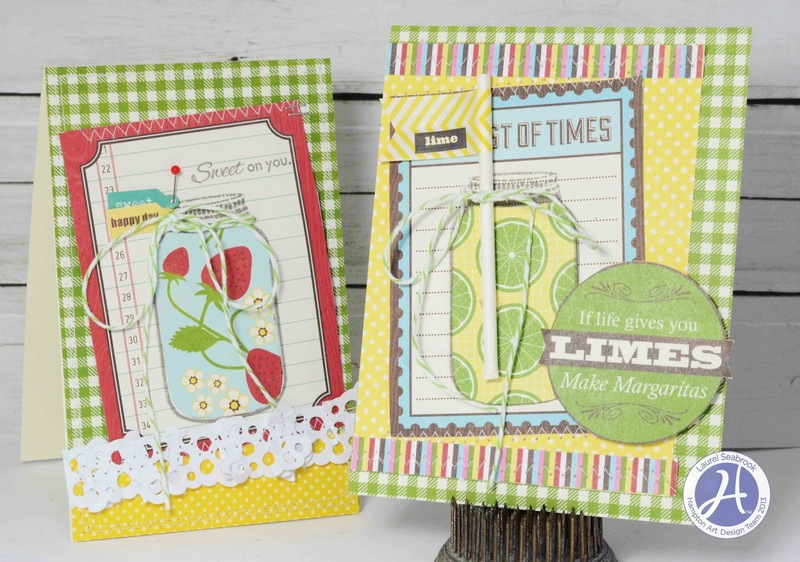 Two sweet cards by Patty Folchert! Two stunning card by Melinda Spinks!